A Birth Injury May Have Caused My Son's Erb's Palsy. Now What? Home » The Law & You » A Birth Injury May Have Caused My Son’s Erb’s Palsy. Now What? A Birth Injury May Have Caused My Son’s Erb’s Palsy. Now What? A viewer whose 11-year-old has Erb’s palsy was told by a surgeon the condition could have been caused at birth. Is there anything the family can do? Birth injury lawyers Greg Fellerman and Ed Ciarimboli offer some legal advice. Dave Kuharchik: It’s time once again for “The Law & You.” As always we have award-winning attorneys that get results when they matter. Greg Fellerman and Ed Ciarimboli are here. Gentlemen, nice to have you on the show today. Ed Ciarimboli: Good to be here. Dave: All right, let’s get to our question. This one involving a medical situation from Kevin in Dunmore. “My son is 11 years old and suffers from Erb’s palsy. His orthopedic surgeon recently told us that this could have been caused at birth. Is there anything we can do since he is now 11?” Now that 11 years have passed, is there anything they can do in this situation? Ed: Kevin, without getting into the specifics of the medicine, and whether it is medical malpractice or whether it was caused during the birth, and the reason it may be caused what’s called the traction during the birth. We handled a number of these cases. Because your son is under the age of 18, they have until the age of 18 and then two years past that, in order to bring a medical negligence case in the Commonwealth of Pennsylvania. Just as in any other medical negligence case, there are some very specific things that you need to do in order to pursue that. But generally speaking on the statute of limitations, even though this happened over 11 years ago, you could still potentially have a case. Greg Fellerman: Everyone hears that term statute of limitations and what that is, that tells you when you have to file a lawsuit by. The law has evolved and it protects minors and what it does it says, “Hey look, we give you until you’re 18 plus two years to file a claim.” Sometimes the law works for you, believe it or not. You get older and you realize you could have a potential problem, it gives you the time to do it. Dave: Some good advice from our attorneys. Greg Fellerman and Ed Ciarimboli, for viewers who may need your legal help, how can they get in touch with you? Greg: They can call us at 570-714-HURT. They can see us on the web at 714hurt.com. Ed: Or go to our Facebook page and if you have a question involving a situation like this, put it on our page and we’ll do our best to answer it in an upcoming segment. 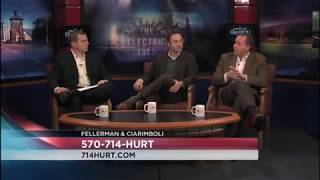 Dave: All right, results matter with attorneys Greg Fellerman and Ed Ciarimboli. Guys, don’t go anywhere because we need you back here tomorrow. Greg and Ed: We’ll be here.